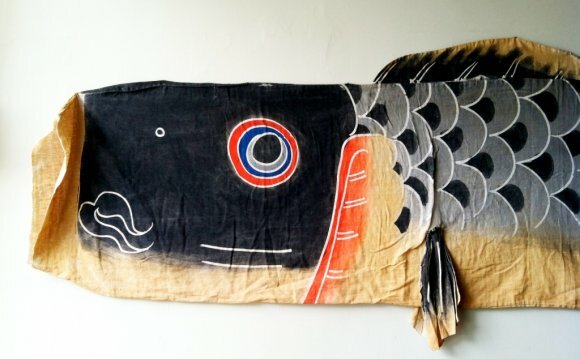 Everything about Japanese koinobori, carp windsock/streamer/kite. CURRENCY CONVERSION All prices on this site are shown in Japanese currency Yen (JPY). Before you place an order, please confirm the true value in your currency desired by clicking below. In Japan, koinobori is a very seasonable item used only for the Children's Festival, May 5th. Generally, you cannot buy koinobori at most of the shops except in the last sales months, March and April, just before May 5th. However, we always have enough stock through a year. You can purchase anytime of a year. The Japanese word "Kiccho" means a good sign of fortune. We have named this type of koinobori "Kiccho", hoping that it will invite the happiness to the whole family which has purchased it. The original pictures of this Kiccho koinobori are drawn by a Japanese-style painter, TOKUNAGA SHUNSUI. This "kiccho" type carp windsock is a high-quality water-repellent koinobori with elegant natural- gradation scale pattern. It is dyed employing the traditional craft skill called "Yuzen-bokashi". This process yields a natural gradation of color. It is sprinkled with gold leaf and has an elegant, rather impressive charm. It is also finished with a water-repellent compound, which gives it good tolerance to the water. This is a unique feature, not previously available. Instructions on How to make a kite?